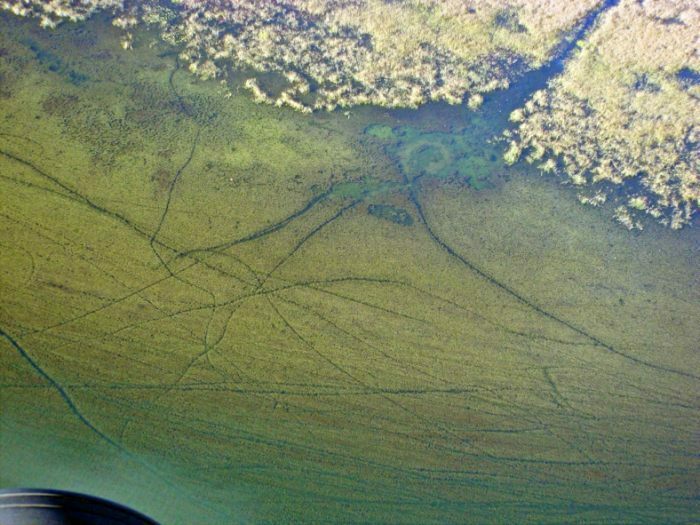 Over the past decade eurasian watermilfoil has been growing at an exponential rate within the Les Cheneaux Islands. 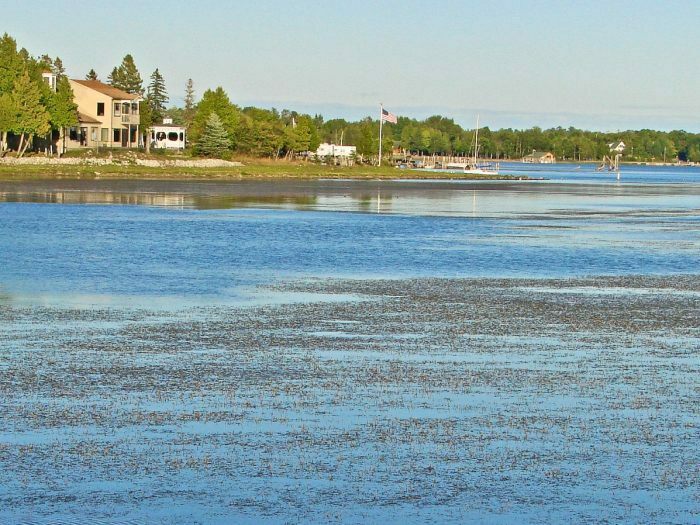 This invasive species is responsible for creating a number of problems, ranging from limited dock access to potentially severe engine damage. Although some level of temporary relief can be realized through a heavy application of approved herbicides, this method often requires more than a week to begin noticing any effect. 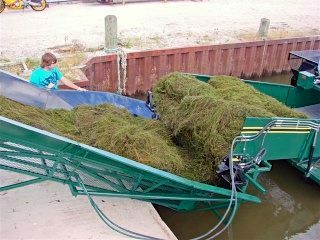 Alternatively, our "weed harvester" produces immediate results, and is an ideal solution to ensure a seaweed free waterfront during your time in Les Cheneaux. 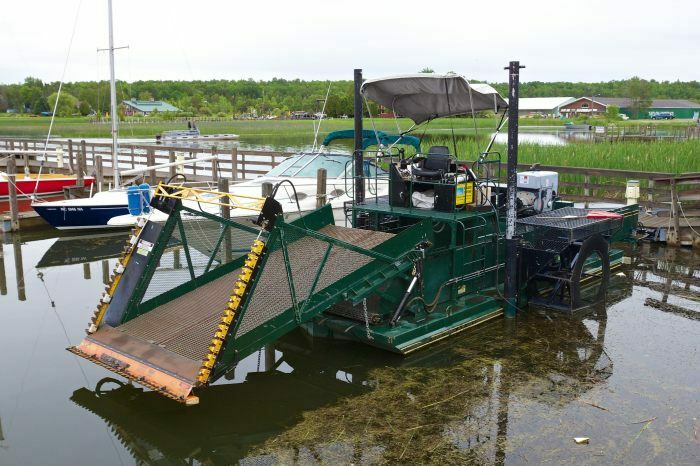 Manufactured by Aquamarine, this vessel is specifically targeted to remove and dispose of underwater vegetation in a manner that leaves the actual lakebed undisturbed. We're able to cut, collect and offload seaweed in a much more efficient and effective manner than any other in Les Cheneaux. Reciprocating knives are mounted horizontally and vertically on a hydraulic "harvesting head" that can reach depths of up to 6'. Once cut, weeds are corralled into a series of conveyor belts, which disallows stray clumps from floating into navigation channels. Slots in the conveyor belts allow weeds to drain as they rest, thereby maximizing "per load" coverage and quantity. Once a full load is reached, the harvester connects to a shore-side conveyor which offloads into a dump truck, then hauls weeds away to an approved disposal facility. Since the Michigan Department of Environment Quality (MDEQ) and US Army Corps of Engineers (USACE) regulate removal of any vegetation below the ordinary high water mark, a permit is required prior to commencing any such work. This type of permit is issued for a period of five years, and authorizes property owners to remove invasive seaweed as needed in permitted areas. Although most clients choose to complete the application themselves (available here), Cedarville Marine offers this service for a small fee. Typically, both agencies will issue seaweed removal permits within 30 days of receiving an application, although longer durations are not unheard of. If you've already got both permits or simply wish to begin the process, please contact us at your earliest convenience.